The new 2-in-1 device from Hewlett Packard Inc.has features that make it adaptable to the way individuals work throughout the day, with four use modes–tent, stand, tablet, and traditional laptop–so users can create, present and collaborate in a comfortable way. Most of us now use our phones for a high percentage of our work, especially younger men and women who have been immersed in connected devices since they were toddlers. But there’s always going to be a need for laptop and notebooks PCs, because certain business tasks require it. HPI, the world’s largest maker and seller of such devices, is keeping its head down to keep innovating in this sector, in which it competes with Dell, Lenovo, Apple, Acer and a list of other companies. The Palo Alto, Calif.-based vendor has released a new, high-powered 2-in-1 convertible (laptop that converts into a tablet by folding the cover all the way back) PC aimed at business owners and mobile professionals—most of which already depend mightily on their phones. However, when they need to work on spreadsheets and other apps that don’t work well on small screens, requirements suddenly change. HPI has been making 2-in-1’s for about five years. Its previous release was a business-type 2-and-1 laptop/tablet convertible, the HP Pro x2 612 G2, at last year’s Mobile World Congress that turned out to be quite a sales hit. This new one could follow the same path. HPI keeps evolving each product with improvements. The new ultra-slim, 14-inch ProBook x360 440 is the first in its product line to feature the 2-in-1 attributes, and it has the power, security and durability for business usage inside the versatile 360-degree form factor. It also features an optional HP Active Pen, which is a help for workers in transitioning to desktop productivity. It also comes with a single cable that supports docking via USB-C.
adaptivity for the way individuals work throughout the day, with four use modes–tent, stand, tablet, and traditional laptop–so users can create, present and collaborate in a comfortable way. Go here to see a spec sheet on all the power, storage and other options that are on the table. A final note, and it's good news: HPI is bound and determined to compete on pricing. 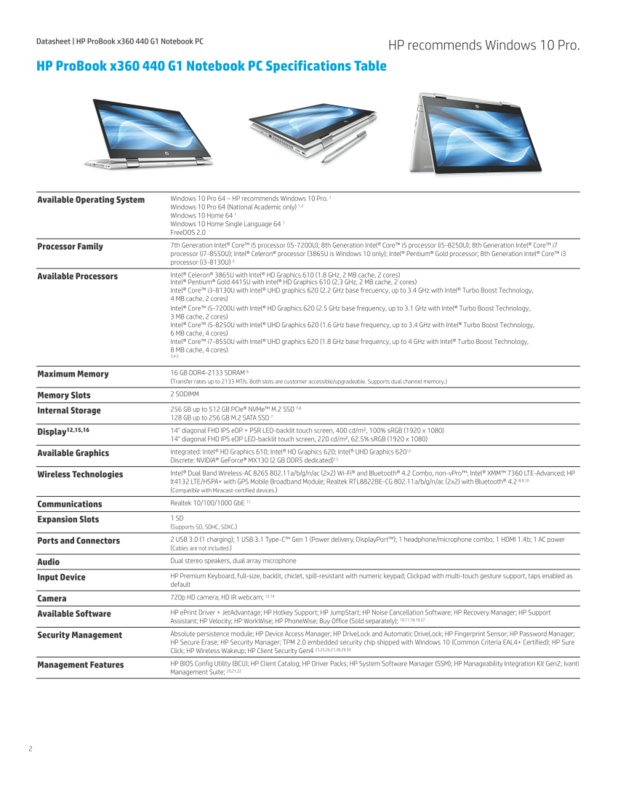 The ProBook x460 440 is available now with a starting price of $599.